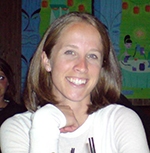 I met Leigh Donovan while she was coaching a three-day women’s mountain bike camp at Mammoth Mountain Ski Area in July 2014. 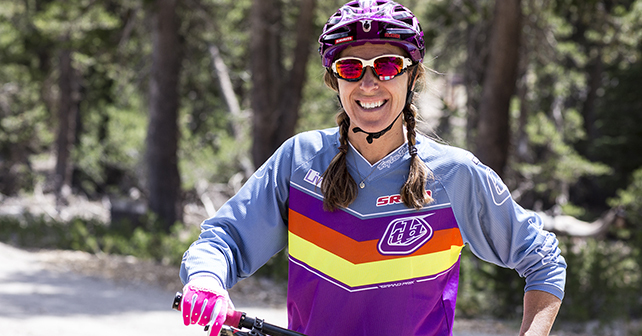 As she smiled and hugged me, it was immediately apparent that this World Downhill Mountain Bike Champion was the type of woman who serves as an inspiration to those around her. Leigh is the proud owner of I Choose Bikes, a bike clinic business through which she shares her vast knowledge and experience of mountain biking with any woman who’s interested regardless of age, ability, etc. She’s using the I Choose Bikes skills clinics that she has developed to invite women to learn how to make mountain biking a positive experience. I instantly fell in love with Leigh and her team of lady coaches. Leigh’s pink, sparkly helmet and the entire team’s rhinestone-bedazzled bike gloves added a splash of femininity to playing in the dirt that made the girly side of me happy. Right away I felt like I was out riding with my girlfriends — no pressure, just fun. We learned from each other as we developed our strengths and recognized and accepted our weaknesses. Even if just for a few hours, I was part of a club of super awesome, super talented women who weren’t afraid to get out and do what they love … all with a bit of feminine grace. World Minded: What inspires you? Leigh Donovan: I was raised in a family with great values that always taught me to give more than you get, so I’m that mom that takes all the kids to the park. I’m the daughter who stayed in Orange County to be close to family. It feels better to give. I like seeing smiles. It was born in me. The affect I have on others is what inspires me. WM: Why do you do what you do? LD: I’ve spent 31 years in the bike industry and it has always been male dominant. We’re going through a women’s movement and I wanted it to include mountain bikes. So right now I’m in the build it and they will come mentality. That’s what I’m doing with the camps. WM: Your camp at Mammoth Mountain was your first three-day event. What was the purpose for holding this camp? LD: I’ve been doing single day camps and private lessons for five years and I wanted to create something that was more of a retreat. It gives these women a break. Some of them are always working for someone else [employer, kids, etc.] and it never stops. This is opportunity to let them solely focus on themselves. It’s also an opportunity to be around other women with similar interests. It’s a bonding experience and all of these women are friends now. There is no intimidation factor and they are less self conscious about riding. Many of them have gone from beginner to sport in just one day, which is phenomenal. WM: How has it impacted your life? LD: I had a dream of going back to college and getting my degree. I’ve wanted to do it for 20 years but I always let something get in my way. With the I Choose Bikes business plan I get to be a mom, a student and coach for women’s camps. It sure makes waking up every day a lot of fun. WM: Your program is called I Choose Bikes, what does that mean? LD: Bikes have always been my hobby, my life, so I choose bikes; that’s what I choose. Nothing gives me as much satisfaction as riding a bike. WM: How do you recommend others become inspired in their lives? LD: Embrace what you’re good at. That inspires you to make that thing better. Our lives are so focused on money that we don’t look at the human side of life. You don’t have to have a lot of money to have a great life. You can live or be a slave. I choose to live.